Boy meets girl. Boy falls in love. Girl doesn’t. 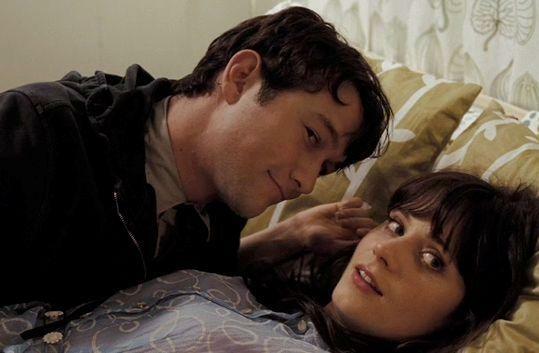 That bitter twist to the indie rom-com formula is what gives (500) Days of Summer such a surprising emotional kick. Surprising, because the set-up is what-evah: Tom (Joseph Gordon-Levitt) is a greetings-card writer who thinks The Graduate has a happy ending, Summer (Zooey Deschanel) is the carefree new-girl-in-the-office who breezes away with his heart. Randomly riffling through the 500 days of their romance, debut director Marc Webb making us put the pieces together ourselves. Sounds like a clever-clever gimmick. And, well, it sort of is. But it’s also what saves the film from cliché. Somehow written by the men behind The Pink Panther 2, the funny, honest screenplay keeps finding tiny moments of hope in the heartbreak – and vice versa. Two sequences are just brilliant: a joyous musical number after Tom first sleeps with Summer and the whole world starts singing; then a split-screen which plays out his expectations of a day next to the crushing reality. Sure, everything’s a little cutesy and predictable. But it’s a rare movie that understands love comes at you like a left-hook: you never see it coming and, boy, does it hurt.